This year’s fashion color is – anything blue. Judging from the number of variations to go with “Rhapsody in Blue,” Downey is definitely with it. Poet and small boutique press owner Frank Kearns showed off his subtle dark blue plaid jacket with a blue shirt front. 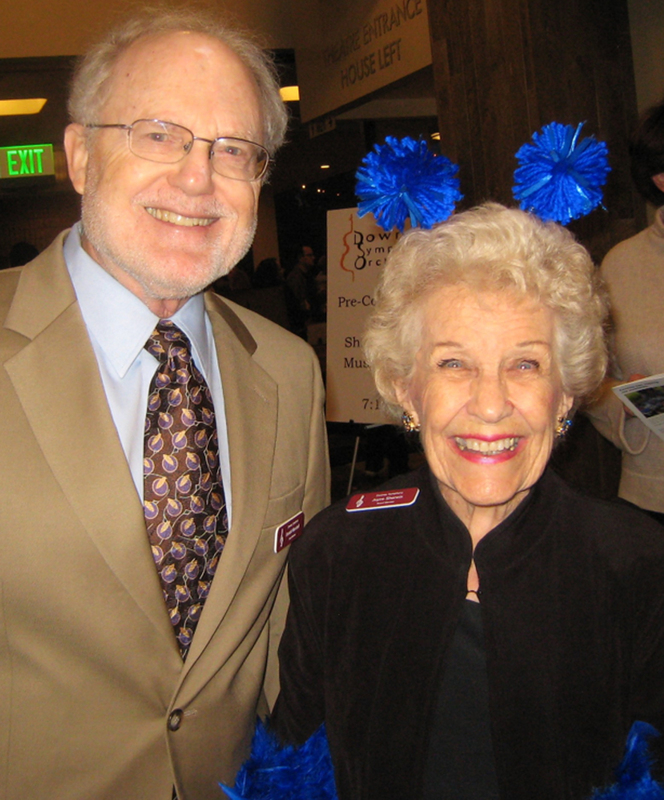 Downey Symphonic Society board member Joyce Sherwin had a royal blue paper boa to match her intensely blue eyes, and on her head, antennae pompoms to match, the better to receive Gershwin’s music. When I sat down in the balcony, the young concert goer in pale blue denim jacket beside me was holding a fragrant cornucopia of white flowers. “They’re for the pianist,” Tess Yoong, age 11, told me. She was there her mom, Esther, who studied piano with Bernadene Blaha, the renowned piano artist who was to perform in the Rhapsody. “Now I teach my daughter,” said Esther. Tess’s dad, Jake, who grew up in Downey, had driven the family up from Fullerton, with little brother who was asleep by the end of the concert; 9 year-old sister Paige made it awake, till the family presentation in the Green Room after the performance. The evening got off to a rousing start with amateur conductor Aaron Saldana and Souza’s “The Stars and the Stripes Forever.” After Intermission, before the auctioning of the baton, Aaron came on stage to tell how much fun it was. “A wonderful experience,” he said, and he thanked Bernice Mancebo Stumps for inviting him to wave the baton. Bernice won the auction last year in honor of her grandson, Christopher Parks. Aaron studied music at the Colburn School, attends Stauffer Middle School and volunteers for the Downey Foundation for Educational Opportunities with the String Ensemble. If the name sounds familiar, it’s because the DFEO was founded by his mother, Linda Saldana. It was an evening of firsts: a new record bid of $3,500 won the right to wield the baton at next year’s April concert. A touching tribute to the Osborn family preceded the auction: Joyce, violinist with the Orchestra, who played with us from the start; Tom Osborn whose 20-year tenure as conductor included the start of the Music in the Schools program; and their daughter Carolyn, our concert master and a well-known violinist in her own right. Carolyn herself acted as auctioneer and teacher Dottie Nadolski, in the balcony, ended up with the winning bid, for the privilege of leading the Orchestra at next April’s concert. Carolyn pointed out all the benefits that Music in the Schools brings to Downey kids, like the yearly morning symphony concert at the theatre for third-, and a different one, for fifth-graders, which is sponsored by the Kiwanis Foundation. The Downey Unified School District is very much involved. Mom was to have helped with the auction, and she would have been proud. On behalf of the guild, the fund-raising auxiliary of the board, Marge Lewis came on stage to present the check, the results of a year’s worth of fund-raising events, a remarkable $15,000. The next big surprise of the evening was that the house was practically sold out. “We’ve sold 701 tickets for tonight” a happy President Don Marshall later emailed the Board of Directors of the Downey Symphonic Society. Out of 748 seats available in the theatre, that number was matched only by the Red Violin Concert of January 2014. Word is finally getting out about the Downey Symphony. Let’s not be a well-kept secret any more. The big audience meant that lots of people were visiting Downey for the first time. Gershwin brought them, and the Orchestra will bring them back. Marshall was happy to be able to announce next year’s 2019-20 season. First concert in October will be the Tchaikovsky’s emotionally stunning Fourth Symphony, the “Pathetic.” January brings a splendid all-Beethoven program celebrating his 250th birthday, with some surprises, and April will feature contemporary American composers and their music. We were honored by the guest presence of Dr. Barry Jordan, chief medical officer of Rancho Los Amigos National Rehabilitation Center here in Downey. Dr. Jordan’s wife, Ruby, accompanied him to the concert, and he thanked the Downey Symphonic Society for honoring Dr. Jacquelin Perry, M. D. The evening’s music was dedicated to her memory. Dr. Perry was an innovator par excellence in the field of the orthopedic surgery and gait analysis. We are lucky to have RLA here, because many Downeyites volunteer their time, skill, energy and money-raising abilities for the Rancho Foundation and the life-changing work done here in stroke rehabilitation, spinal cord injury and many other kinds of therapy. Dr Perry loved a well-made tune, and she would have enjoyed the jaunty pace of the city stroller in “American in Paris.” She might have imagined an accompanying visual effect, a cartoon of animated bones and tendons and muscles, coordinating to promenade in a calibrated gait with a spring in the step and navigating the City of Light. Conductor Sharon Lavery did a masterful job with the music. “Catfish Row,” the Symphonic Suite Gershwin made from his folk opera, is the culmination of the sophisticated style that Gershwin had achieved shortly before his unanticipated early death at age 38. The songs are played without words but their unmistakable melodies bring the lyrics to mind. The muted trumpet’s wail, “Bess You Is my Woman Now” is all soul and sentiment. The rich lushness of Summertime rises out of the strength of the full string section. And when Porgy announces “I Got Plenty o’ Nuttin,” Gershwin uses the poorest percussion instrument there could be – the wooden block. But the insouciant way it is knocked tells the world about Porgy’s growing confidence in himself. After Intermission, “An American in Paris” began, as hoped for, with real French taxi horns blaring as a young man crosses the busy Boulevards and Places in the 1920’s artist capital of the Jazz Age. The “Strolling in Paris” theme was off to an awesome start. Then the homesick bluesy part set up Gershwin’s street creds, and the vibes told us he owned the house. Finally came the piece everyone was waiting for. Pianist Bernadene Blaha came out in in sparkling black top and an iridescent long blue skirt, seated herself and waited for that long tickle of the glissando glide of the clarinet – licorice stick is a better name – that opens “Rhapsody in Blue” with the most recognizable first bars since Beethoven’s Fifth. The Orchestra outdid themselves, and in the applause and curtain calls, each section was recognized, as well as the strong string section. SEEN ON THE PATIO: Rotary President Greg Welch and wife, Barbara Risher Welch, a past district governor of Rotary, thanking Symphony President Don Marshall for his donation of a bottle of Spanish champagne to go with two 2019- 20 Symphony season tickets as a prize for the silent auction at the gala that Rotary Club of Downey is having next week. Honoring the Downey Family YMCA and the TLC Family Resource Center, this second annual event will be held at Downey’s Embassy Suites. Barbara Briley Beard talking with Roy Anthony Shabla and poet Clifton Shyder, former professor at Long Beach State. “Clifton is going to be the featured poet at Roy’s next Green Salon,” Barbara said. They are held on the fourth Saturday of the month. Barbara and Roy are on the board of the Downey Art Museum in which they both believe ardently. They’d like to find a way to bring the museum’s permanent collection back to Downey. Fight on, Barb and Roy. Glass artist Terry Walker, whose wondrous pieces are often on display at Roy’s Green Salons, walked by. Carolina Estrada-del Toro and ceramicist hubby Jorge had pieces in the art show, “Earth Recycled II,” curated by Pat Gil, president of the Downey Art Coalition, who moved endlessly in apricot silk, welcoming the patrons. 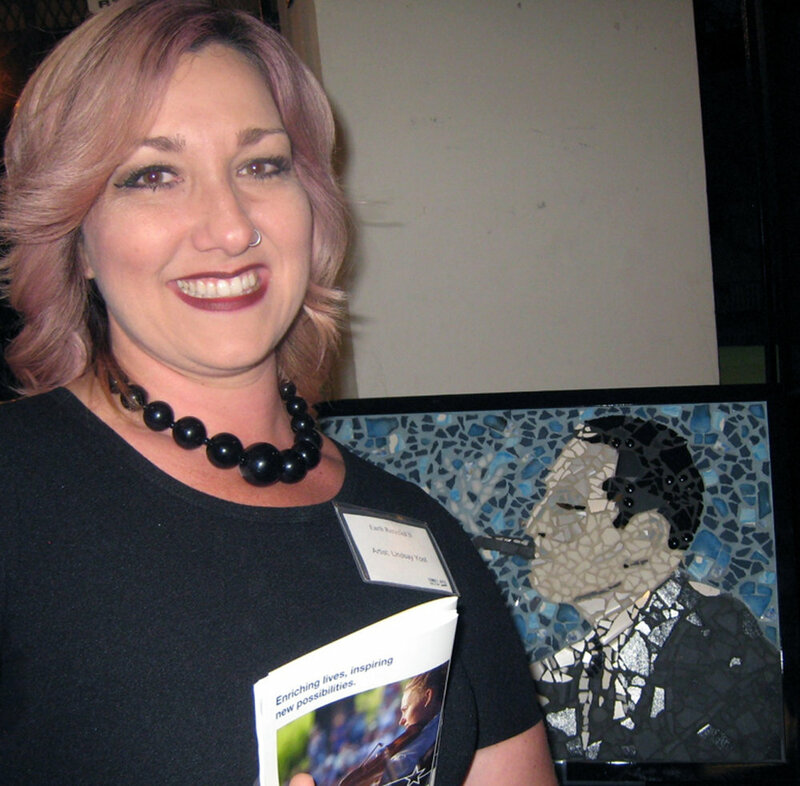 Newly appointed as adjunct professor at Long Beach City College, Lana Joy Walhquist announced the names of the artists in the show, as each stood and took the audience’s applause. Rachael Lorenzetti slipped into the Gershwin songs like a cabaret chanteuse, in her black and white mirrored Art Deco gown. Proud father stood back. He looks so like his dad Sal, whose Sal’s Market we all loved to shop in. Lars Clutterham played wonderful piano accompaniment for her Broadway songs, and they used a side stage for that intimate effect that Marsha Moode did so well with the Downey Civic Light Opera. Diane and Joe Lumsdaine, longtime supporters of good music in Downey, chatted with Sister Eymard Flood while Chad Berlingheiri, fresh from his December program, “Christmas in Downey,” stood by, probably planning his next captivating seasonal program. Roy Beard helped fellow Kiwanians Larry Lewis and Bill Hare in pouring the bubbly for the reception after the concert. The entire audience was invited to enjoy complimentary champagne and punch and cookies, home baked by the board and the guild, on the patio. Next? There’s the Symphony’s early date Concert in the Parks, June 23, free to all comers. Bring your blanket and the kids and the picnic. It will be blissfully warm. Now the question, what did all the earnest and loyal promoters of the Symphony’s program do right, to get such a warm and enthusiastic turn-out for its season’s finale? We’re all the lucky ones.